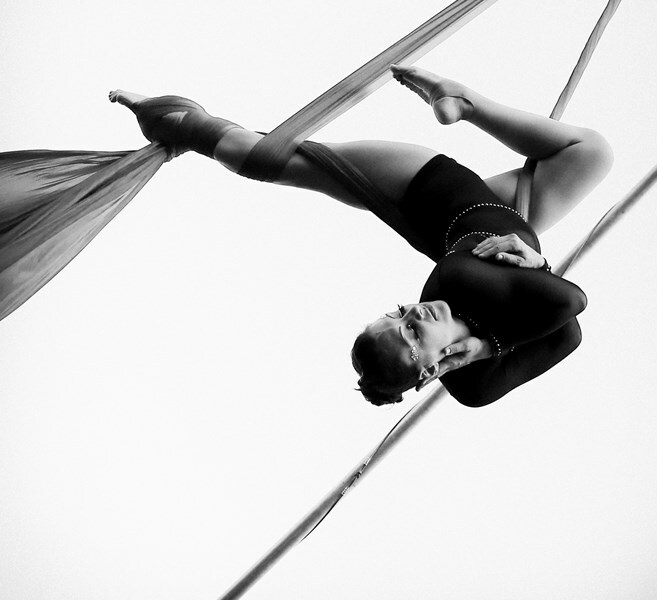 Professional aerialist, circus coach, choreographer, personal trainer, business consultant and happy person! Most weekends, you will find me dangling from the rafters performing one of my solo &/or duo acts: silks, lyra, trapeze, aerial bartending etc. During the week I travels to public schools, dance schools, gyms etc teaching aerial & circus arts including: juggling, hula hoops, unicycle, wire walking, partner acrobatics, hand balancing, human pyramids, stilt walking, silks, trapeze and more. I am proud member of the American Youth Circus Organization (AYCO) and the American Circus Educators (ACE) where I speak on various circus topics and teach workshops yearly. Fun fact about me, my costume closet is at least 5x bigger than my everyday closet. If I don't already have the costume/look you want, I'll gladly make it. Please note Guinevere DiPiazza will also travel to Alhambra, Bell Gardens, Glendale, Huntington Park, Maywood, Monterey Park, Bell, Hollywood, Pasadena, South Pasadena, Montebello, South Gate, Burbank, Beverly Hills, Inglewood, Rosemead, San Gabriel, San Marino, Culver City, Downey, El Monte, Lynwood, Pico Rivera, Toluca Lake, Universal City, Willowbrook, Compton, La Canada, Montrose, North Hollywood.